Since the beginning of our renovation our two neighbors have been polar opposites regarding the inconveniences. On one side we have a cautious woman who we’ve heard from only once or twice. On the other is a very opinionated gentlemen who calls me an average of once a week. Back in November when we demolished our extension it exposed a 1 foot wide strip of brick on the rear wall of his building. The rest of this wall was painted white and we thought it completely reasonable when he asked if we would paint the exposed brick to match the rest of his house when our extension is finished. The area in question is left of the drain pipe. Fast forward six month later and our house is still under construction with no work done on his building or his side of our extension. Over those months he would ask about it whenever I bumped into him and each time I’d explain that the weather needs to be dry and warm in order to complete the stucco and his wall. As the months went on so did his frustration. At the beginning of May he left a voicemail demanding that the wall be repaired and painted by the end of the month or he’ll bring in his own guys and send me the bill. To be honest, I agreed that the delay had been unreasonable and said I’d pressure my contractor because I want the side of my house done just as much as he does. After all it had been warm and often dry for several days. As the month went on it rained here and there followed by more and more delays until it was the final week of May. It was a warm week but it looked like rain in a few days. I confirmed with my GC that we were going to side the following week. He said yes definitely. So it rained Tuesday and a little Wednesday. I speak to him again. We’re starting Thursday right? right!.. Finally on Friday May 31st, the last possible day, a crew shows up around 11am with materials ready to do his house and mine. They setup scaffolding and promptly head out for lunch. I call my contractor who says they went to lunch and relax everything will be Ok.
At this point I’ve lost my cool and start yelling back at him that he agreed to give us till then end of the day and that’s several hours away. He doesn’t care and continues to repeat the get out mantra. So, I ask to speak with the foreman. My neighbor hands him the phone and I explain that he must begin working on the exposed areas on my neighbors brick wall right away or our entire project will be screwed. He immediately says…. “ok” and then they start on it (really?). My wife goes over to the house around 3:00pm to check on things and make sure our neighbor knows how concerned we are. She can’t find my neighbor. There’s no answer at the door but she talks to our foreman who reports that they are working on his house now and will finish today. 3:30pm I call my neighbor and get no answer. 5:00pm I call again and get no answer. I can’t figure out if he’s Ok now but figure there’s nothing I can do. 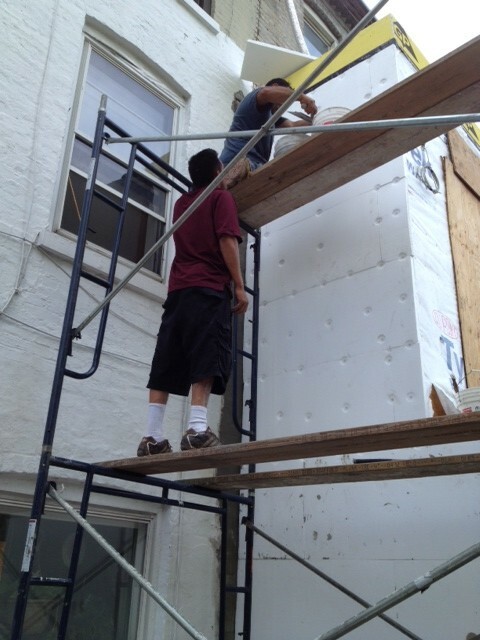 Later, I get a text from my contractor and I call him back to learn that the neighbor is being completely nice now and even allowed the crew to leave the scaffolding up in his yard for the weekend. So I call my neighbor to hear his side and get a similar response. Over the weekend I saw him and he even joked around about it. Basically he says, “I thought you were making a fool of me and I’ve found that the best way to get things done is to just be a mother f*%$#!r. As long as I get what’s due me, we’ve got no problems.” I didn’t have the heart to tell him next week calls for rain.